Mideo offers Innovative Forensic Imaging Solutions for Crime Labs and Law Enforcement agencies. Our solutions include digital evidence management with comparative analysis capabilities. Our Imaging Database Software is designed to be scaleable and can support both Forensic and Investigative Services as a part of one easily managed network application. CaseWorks is ideal for forensic laboratory directors that would like to provide their staff with advanced imaging capabilities, which are not included as part of the traditional LIMS. Caseworks is a client/server data-based software that provides an agency wide standardization for the photo documentation of evidence with specialized tools for all of the comparative analysis disciplines. A forensic lab with the combined capabilities of these systems has unrestricted ability to implement continuous improvement of their scientific documentation processes as well as helping to support any other labs initiatives to go paperless. LatentWorks is ideal for law enforcement agencies that are dissatisfied with the traditional paper-based, disjointed finger print documentation processes. Our software solutions provide a systematic end-to-end approach to the latent examination process. Unlike the current multi product build-it-yourself solutions, Mideo has assembled a complete solution which not only covers image enhancement and digital asset management, but it also includes Latent Workflow Management and Standards-Based Reporting capabilities unlike any system available on the market. 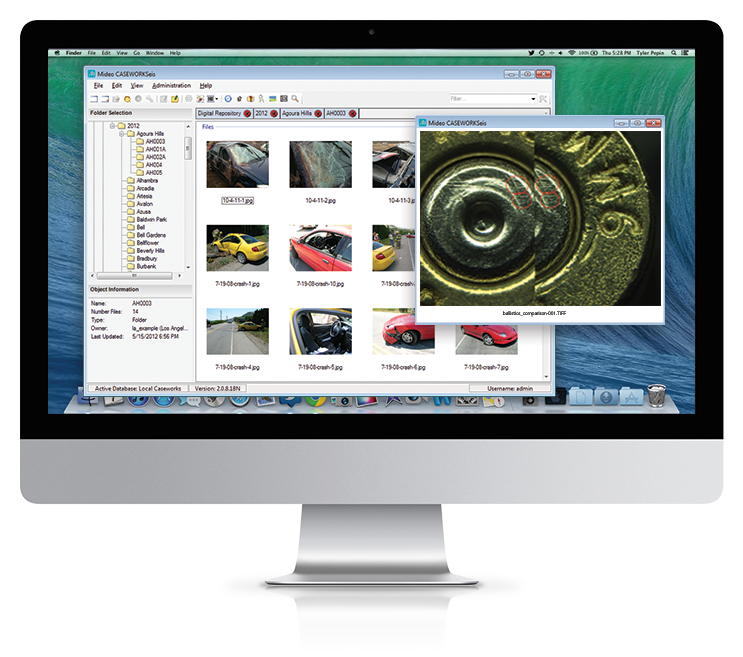 CaseWorks Thin Client Mobile Interface provides the Crime Scene Investigators Photo Lab and Patrol all the tools necessary to securely upload and manage all forms of digital images, videos, and audio files. Mideo GunWorks Workflow Module provides the ability to move to a more paperless approach to efficiently manage Firearms, Ballistics, and Toolmarks related case images, information, and case notes. CaseWorks is also an ideal solution to securely manage and share images from death scenes, autopsies and pathology. Our This Client Interface, flexible data fields and reporting can provide an essential tool for the disaster response team. Our Fingerprint Comparison Training Course is a complete blended, skills training program. It includes our TrainingWorks computer base training system and all of the lecture content, reference materials exams, and over 12,000 comparison examples to train a new fingerprint examiner to expert status.